It's not often that I'm surprised by worldly people. I generally assume that they will make poor decisions, lie, cheat, and steal to get to the top. This probably isn't the best attitude to have when you're a Christian, but I've seen my assumptions proved correct a lot more often than not. Imagine my suprise (not so much) when I find out from my Arkansas friends and family that our head football coach, Bobby Petrino, was becoming embroiled in a scandal. Apparently over the weekend before Easter, Coach Petrino decided to go for a ride on his motorcycle. Not shocking, the hills of northwest Arkansas have lured many motorcycle rider to enjoy the winding roads during the fall and spring. Unfortunately for Bobby, he wrecked his motorcycle that day. When questioned by the university about the accident, he was adamant that he was on the bike alone. And then 911 calls surfaced, eyewitnesses, police reports, suddenly Bobby discovered that he was caught. He wasn't alone on that motorcycle. In fact, he had a 25 year old woman on the back, who was not injured, but was involved in the accident. So the university began to investigate. Why would he lie about it? What the university found out was that Bobby had been cheating on his wife with Jessica Dorrell the woman in the accident. Having lived in Arkansas until I was almost the same age as Ms. Durrell, I understand Razorback sports, especially football, in the state. We don't have any professional sports teams, so Arkansas unites its football ferver﻿ behind the boys in Razorback red, the Hogs. Because I know the depth of love that Arkansas has for football, what an amazing season we had last year (we only lost to Alabama and LSU), and that Arkansas was poised to have a team that could win the entire kit-and-caboodle, I fully expected the university to fine him, suspend him, and then move on with the season. After all I don't expect a Division I college football team, especially in the SEC, to do anything more than to make a pro/con list, then draw a huge $ over the entire thing. Usually that is what makes the decision many times in sports, the almighty dollar. Petrino was able to get money flooding into the Razorback football program. He'd solidified the Razorbacks as contenders. And heaven help us in the 2012/2013 season, if he was able to lead the team to a championship! Bobby Petrino was placed on administrative leave while the University of Arkansas investigated exactly what the relationship was between him and Ms. Durrell. 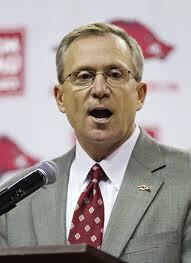 A few days later, Atheltic Director Jeff Long, called a press conference to let everyone know that Bobby Petrino was fired as the University of Arkansas' head football coach. He went on to list the depth of Petrino's deciption. Not only had he cheated on his wife, but he'd hired his mistress for a job in the footbal program. A job that over 150 people had applied. He also gave her a $20,000 bonus, which she promptly spent on a new Acura. 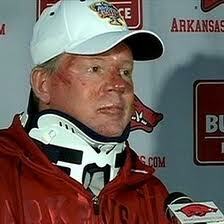 And that was the end of Bobby Petrino at Arkansas. And also the beginning of my surprise. It had happened. Someone had actually looked winning and money in the face and given a resounding NO. The university had stood up for what was right, not what was easy. I would love to say that all Arkansas fans were proud of Long's decision, but that would not be true. Most of them were, though. Most of us were proud to support a team that put honesty, integrity, and morality above the bottom line. So whether we have a winning season or not this next year, even if we don't make it anywhere close to the championship game, I know that I will be prouder than ever to be an Arkansas Razorback fan. It doesn't take a lot to surprise me anymore, but I have been happily surprised this week. For once the right thing was done. I only wish it happened more often.